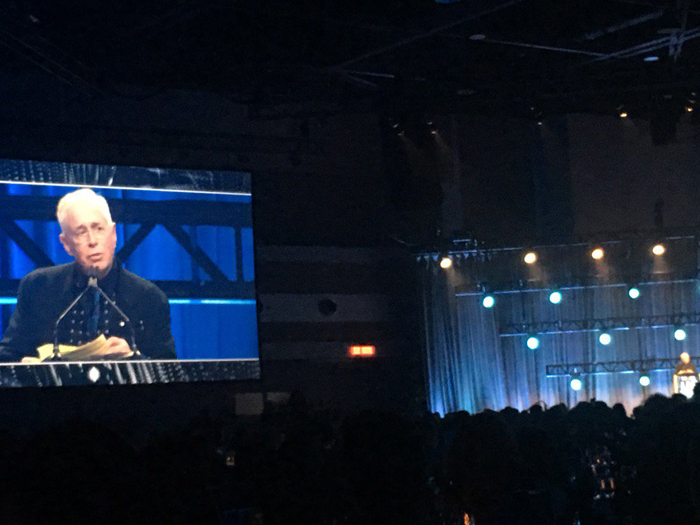 On Saturday September 23, 2017 Bruce Cockburn along with Neil Young, the group Beau Dommage, and Stéphane Venne were inducted into the Canadian Songwriters Hall of Fame. Scroll to the end for Bruce’s acceptance speech in his own hand. 14 January 2018 – This is the short film biography that was shown on the big screens during the celebration. Published to YouTube by: Matt Zimbel – What an honour to tell this man’s story. Writer / Producer MZ, Editor Hugh John Murray, Voice Over, Olaf Gundel. 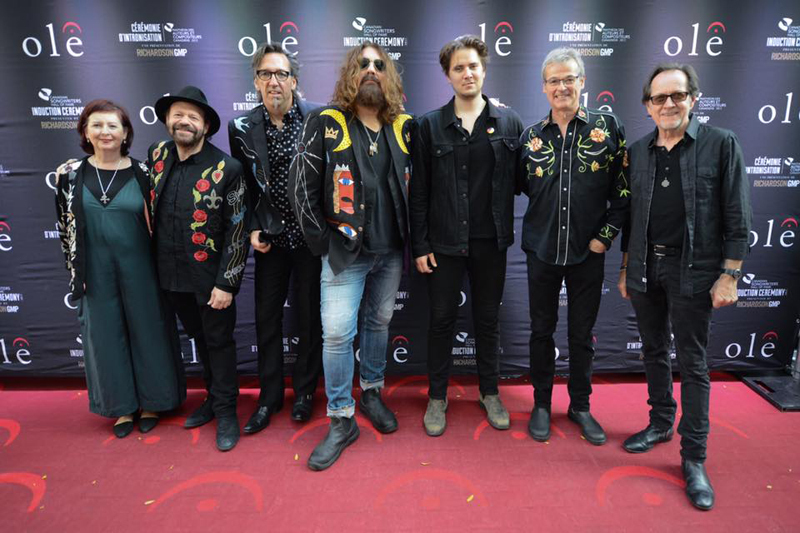 The impact of four life-changing Canadian songwriters — Neil Young, Bruce Cockburn, the group Beau Dommage, and Stéphane Venne — was the common thread at the Canadian Songwriters Hall of Fame (CSHF) induction ceremony over the weekend at Toronto’s Massey Hall, where professional musicians of all ages — and one former astronaut — expressed their respect and gratitude for their music. This was the first induction ceremony in six years. 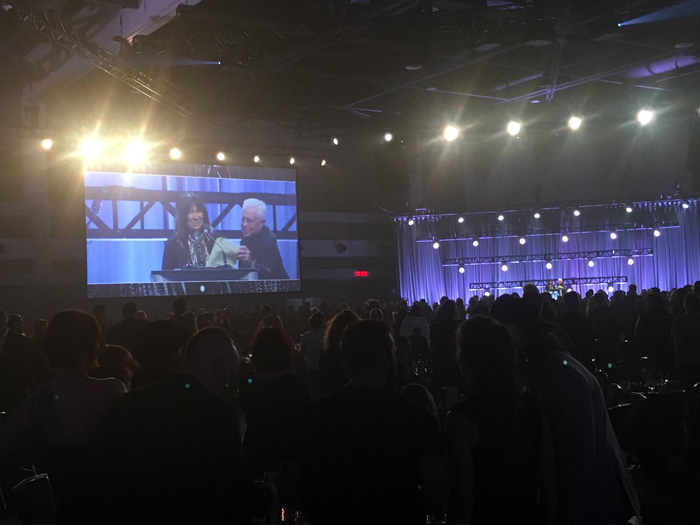 The CSHF was created by music publisher Frank Davies in 1998; the inaugural gala was held in 2003 with six more to follow. The Society of Composers, Authors and Music Publishers (SOCAN) purchased it in December 2011 and has been working to update the brand and educate the public about its inductees and mandate. The historic Massey Hall, which opened in 1894, was the perfect setting for such esteemed honorees. Both Young and Cockburn have recorded live albums there and the late Jonathan Demme’s final doc on the folk-rocker, 2011’s Neil Young Journeys, culminates in two performances at Massey. It’s a venue many Toronto artists dream of headlining — our Carnegie Hall. The four-hour show, which ran an hour over schedule, was a bilingual affair, giving equal time to the two Quebecois legends, even if, truth be told, many of the Anglophones in the audience found their own grade-school French studies proved absolutely useless. Each artist was feted with covers of their songs and stories about their influence, plus the customary tribute video. The evening began with an cappella group Eh440 singing and beat-boxing Cockburn’s “Lovers In A Dangerous Time” from the back of the hall, down the aisle to the stage, right past the songwriter himself, as well as Neil Young with “true love” Daryl Hannah; Buffy Sainte-Marie sitting next to Randy Bachman; Venne, and members of Beau Dommage. A performance of Cockburn’s “If I Had a Rocket Launcher” by Blackie and the Rodeo Kings added another notch to the political tone of the event. Lisa LeBlanc joined them for Wondering Where the Lions Are. There was also a performance by William Prince & Elisapie Isaac covering “Stolen Land” and Hawksley Workman & Don Ross covering “Silver Wheels”. 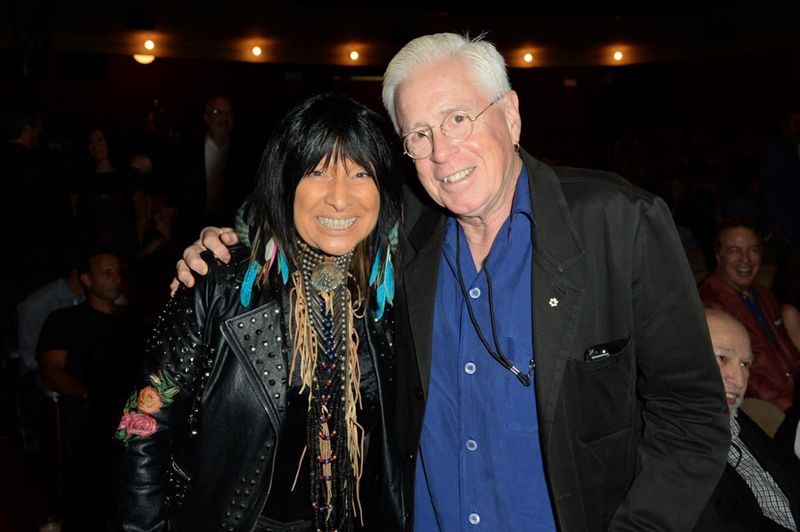 It was followed by Buffy Sainte-Marie who offered her perspective on the songwriter’s career as she introduced him onto the stage. “Bruce is an agitator, an activist, a protester,” she said. He writes “words that move the needle of public opinion” and that “shine the light on injustices,” Sainte-Marie added. To view above speech in standard pdf viewer click here. 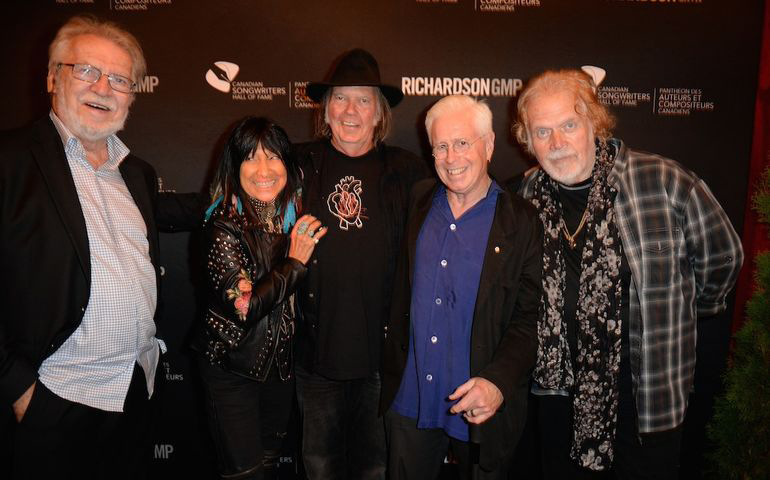 Thank you, Canadian Songwriters Hall of Fame. Thank you SOCAN. I spend so much time playing and singing my own songs — it’s very interesting, very moving, to hear them performed by others! And on an occasion like this — to be so honored in the company of these wonderful artists. I’ve been at my craft for a long time — long enough that the beginning seems like yesterday. 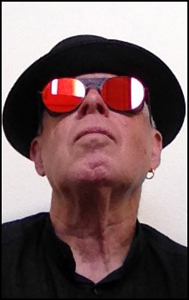 Under the influence of those who were a bit quicker on the draw than me, Bob Dylan, Gordon Lightfoot, Buffy Sainte-Marie among others, I was seduced away from the pursuit of an education in jazz composition by songs…creations that combined music with something like poetry. Though I didn’t understand it at the time, I came to realize that art, including the art of songwriting, is about sharing the human experience. Music is a spiritual bonding agent, a means of sharing deep feelings of all times. When you add words, the sharing becomes pointed — specific. A song can offer inspiration, distraction, solace, solidarity – a sense that we are not alone in our feelings. The human ability to create songs is precious and vital. We have always done it and I think we always will — the artifice of machines (and ISIS) not withstanding. I’m immensely grateful to have been allowed to live a life centered around songwriting. And immensely grateful for the attention my efforts have received. To be able to do this and make a living at it is truly a great gift. Re “Making a living at it,” I want to offer a word of thanks to Bernie Finkelstein, my friend and long-time manager, from whose asute ears and talent for strategizing I have benefited greatly. So too, all the excellent producers and musicians I have worked with, some of whom are here tonight, who have helped give my raw material the power to appeal to the world at large. In a world increasingly defined by its fakery, we’ve together pulled off the greatest trick ever — we spread truth. 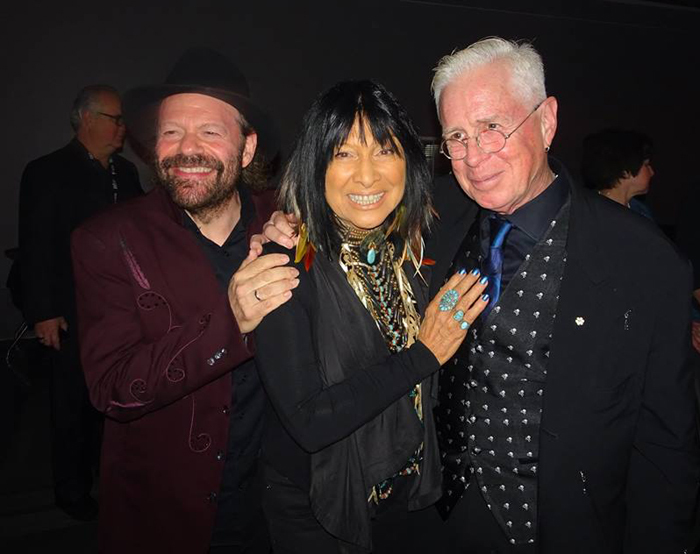 April 1, 2017 – Buffy Sainte-Marie was presented with the Alan Waters Humanitarian Award at the 2017 JUNO Awards by Bruce Cockburn.